The months after the death of Frith were difficult for Tyndale. Not only did he lose the help of a trusted companion, what did his death communicate about the continued opposition to the Word of God by the English rulers? Although he had been tricked into putting his thoughts on the Eucharist into writing, Frith had stated that the doctrine of the Eucharist was not as important as the doctrine of Christ. In his opinion, freedom was permitted concerning those doctrines about which the Word of God did not speak with absolute clarity. However, for English churchmen what was important was what the Church taught. From that teaching there was to be no deviation. Moreover, how could people be sure that the opinions of the church officials were correct when they were denied access to the Word of God? Thus, Tyndale redoubled his efforts to give the ploughboy the Word of God in a language he could read and understand. There is evidence to indicate that Tyndale continued to translate the Old Testament books. However, the main focus of his work was a thorough revision of the Worms New Testament that had been published eight years before. During those years, Erasmus had published a fourth edition of his Greek New Testament containing readings from the Complutensian Polyglot that was finally published in 1522. In addition, the Worms New Testament had been produced under the most difficult of circumstances after Tyndale and Roye were forced to flee from Cologne. With the relative safety of Antwerp and living in the Merchant Adventurers’ house, Tyndale believed that he had the time to do a thorough revision of the New Testament. In addition a number of the Worms New Testaments had been confiscated and the demand for them remained high. Making the situation even more urgent was that pirated editions of the New Testament began to appear in England. They were printed by Dutch printers who were willing to risk producing New Testaments and smuggling them into England because of the lucrative market. This continued even after one of the Dutch printers was arrested in London, imprisoned and later died. However, what appears to be the main reason for the revision of the Worms New Testament was the printing of the New Testament as it had been “corrected” by George Joye. This revision had been undertaken by Joye even though he was aware that Tyndale was preparing a new edition. The crowning insult of this revision was that it contained changes in the translation that Tyndale did not agree with. Joye changed Tyndale’s translation of “resurrection” to “life after death.” Although there remains some dispute as to whether or not Tyndale believed in “soul-sleep” this did not give another person the liberty change Tyndale’s translation without permission. In light of what Tyndale believed to be the correct translation of the word, this was totally inexcusable. In the introduction to the revised New Testament, Tyndale took Joye to task for his unauthorized changes. He conceded the liberty for persons to translate the Scriptures according to their ability, but common honesty required them to append their names to the translation and not to pass it off as the work of another. Tyndale complained that Joye had acted the part of “Bo-peep” in what he had done. Joye sought to defend what he had done but Tyndale brushed aside his explanations as insufficient. It is impossible for us to know the amount of time that Tyndale spent in the revision of the New Testament but there were more than three thousand changes. In addition he wrote introductions to each book to provide a key for the ploughboy to understand the Scriptures better than the priests. There is a fascinating story involved with the publication of this book. Bishop Cuthbert Tunstall, the Bishop of London, went to Antwerp to conduct a mission on the behalf of King Henry VIII. During his journey, Tunstall devised a plan to purchase English New Testaments and send them to England to be burned. English officials were aware that Tyndale made Antwerp his headquarters although they were unable to apprehend him. However, they knew because he was there so would be copies of the Scriptures. In the event, when Tunstall arrived in Antwerp, he began to inquire regarding the purchase of copies of the New Testament. Word of what the Bishop was seeking reached the ears of Augustine Packington, an Englishman and member of the Merchant Adventurers. He went to the Bishop and asked how many copies of the Scriptures he would be interested in purchasing. Tunstall replied that he was interested in purchasing as many as Packington could obtain. Packington, who was a friend of Tyndale, reported the Bishop’s request to him. To Packington’s surprise, Tyndale was willing to give him as many copies as he wanted. Tyndale believed that the burning of God’s Word would be distasteful to the English people and the Bishop’s money would finance the printing of the second edition of the New Testament. According to the popular explanation, this is exactly what took place. The account states that the Bishop got the books, Packington got the thanks, and Tyndale got the money! With the Bishop’s money he had the New Testament printed by Martin de Keyser. While the above account may seem too neat to be totally true, Sir Thomas More attested for its accuracy. He reportedly said to George Constantine, an Englishman charged with heresy, that he would free him if he would be tell who financed Tyndale’s printing of the New Testament. When Constantine replied that it was the Bishop of London, More replied that he knew as much because he had told Tunstall exactly what would happen if he pursued his plan of buying New Testaments in Antwerp for the purpose of shipping them back to England to be burned. The great lesson that can be learned from this incident is that when God wants His Word given to His people, He will arrange events so that His enemies will pay the expenses! The second edition New Testament published in 1534 was a great improvement over the Worms New Testament and found a ready market in England. Tragically, the Bible in English continued to be a forbidden book. The ecclesiastical and political authorities sought to have it confiscated and burned. As a result there are only six or eight copies of the Tyndale New Testament of 1534 that remain today. 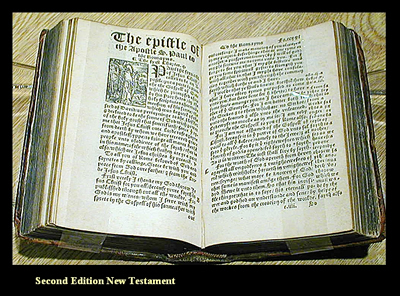 One of the extant copies of the second edition Tyndale New Testament is on display at the Scriptorium in Orlando, Florida. As far as can be determined, it is the only copy of this important work that is privately held. Tyndale would once again revise the New Testament before his arrest, imprisonment, and death. But the second edition Tyndale New Testament remains as a monument to his desire to give the Bible to the English ploughboy. Always top work!!! Super site!